Our Residential Redevelopment company has extensive experience buying all types of problem properties and we want to help YOU. We can give you a fair market cash offer on your property and can close quickly. Size, location, and condition don't matter. We're ready to buy your house TODAY. 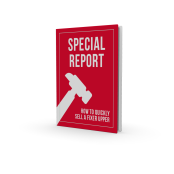 If for some reason we can't buy your house, our FREE report "SPECIAL REPORT: How To Quickly Sell A Fixer Upper" will give you 7 tips for selling your property quickly and for top dollar. © Credible Property Solutions All Rights Reserved.